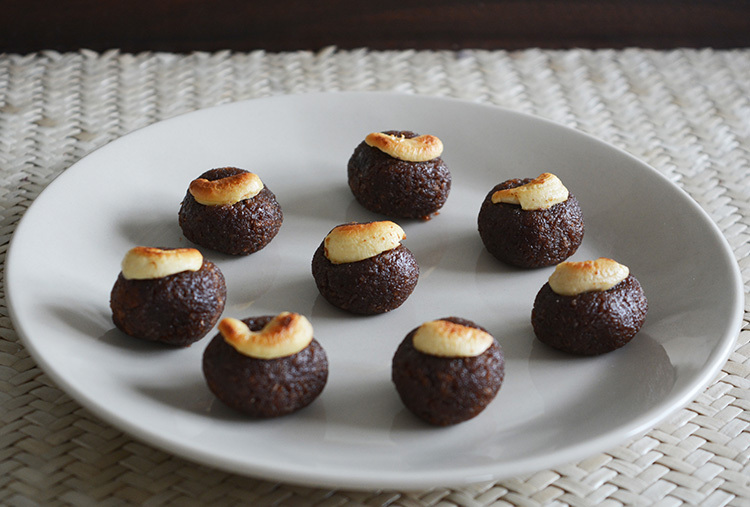 This recipe is a modified version of a traditional south Indian sweet called “Kamarkattu”, which in English is coconut jaggery balls. Remove the crusts/edges from the bread and blend to create breadcrumbs. On a low heat, add the jaggery and water into a pan and stir until the jaggery dissolves completely. Add the rest of the ingredients (bread crumbs, desiccated coconut, cardamom powder, ghee, and cocoa powder) to the jaggery water and keep stirring. Mix the ingredients until it becomes thick enough to roll. 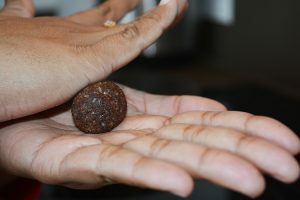 Make small balls out of the mixture while it is still warm. 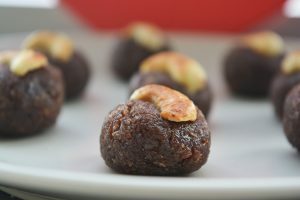 Place roasted cashews on top of the balls for decoration.